Batteries have always been an interesting subject for me and after the test of disposable Alkaline cells, I felt there was another unanswered question. To help answer it, I dug up my old Grandcell Rechargeable Alkaline Manganese Battery Charger (GBTL208MB) from around late-1998. In the mid-to-late 90’s, rechargeable battery technology was rather lacking. The dominant market technology was Nickel Cadmium (NiCad) which had a number of deficiencies. One major concern was the cadmium content, a heavy metal element which is toxic and could leech-out in landfill once the batteries were disposed. The batteries also had a limited capacity, 600mAh was common with 1000mAh towards the later years for premium-quality cells. 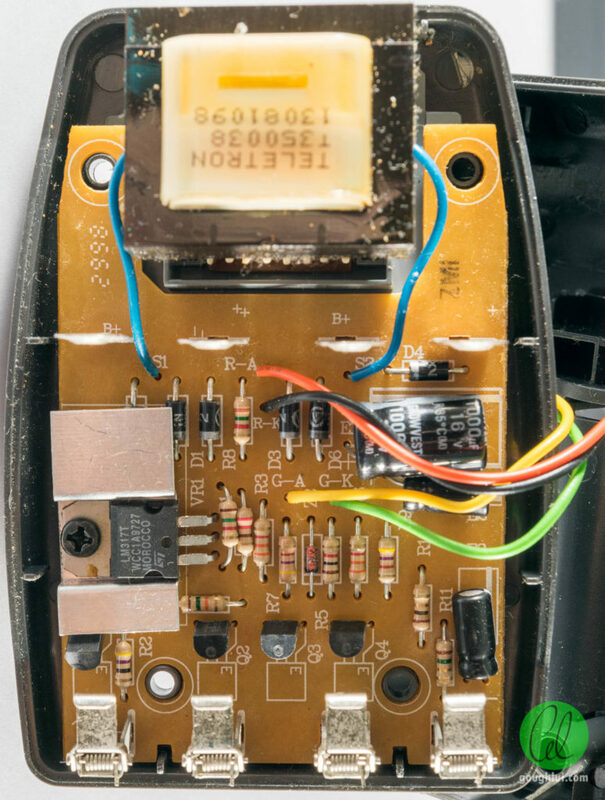 Their 1.2V chemistry also caused problems in devices designed for 1.5V alkaline cells, especially when a number of the cells were used in series and the voltage difference added. NiCads were also significantly more expensive than primary cells (on upfront purchase cost), prone to significant self-discharge, required long charge times on cheap chargers which utilised the “trickle charge” method and were purported to suffer from memory effect requiring complete discharge before recharge. Around 1998 according to this summary of events, Grand Batteries Technologies licensed the rechargeable alkaline manganese (RAM) technology from Battery Technologies Incorporated to launch Grandcell batteries made in Malaysia. According to the archived page from Grandcell, the technology overcomes most of the deficiencies in NiCads, while being more friendly to the environment and available through most major retailers. They claimed the cells could be recharged up to 25 times in magazine advertisements, although it seems their FAQ revised this down to 10-20 times. Given the batteries only cost around twice as much as regular disposable alkaline batteries and were easily obtained, it was an attractive proposition. Unfortunately, the batteries have long since been discarded as their lifetime was underwhelming to say the least. As recharging the “special” batteries required a special charger, I kept this in case it would be useful in the future. 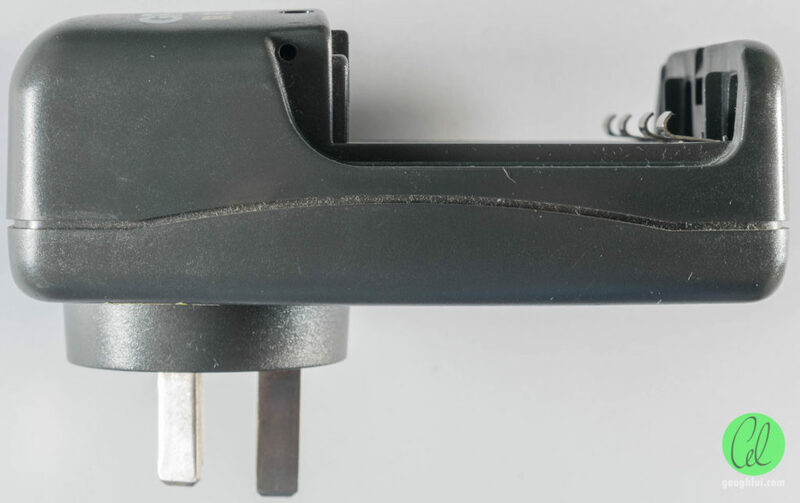 The charger originally had a spring-loaded smoked plastic cover over the battery compartment, but this has since been lost. 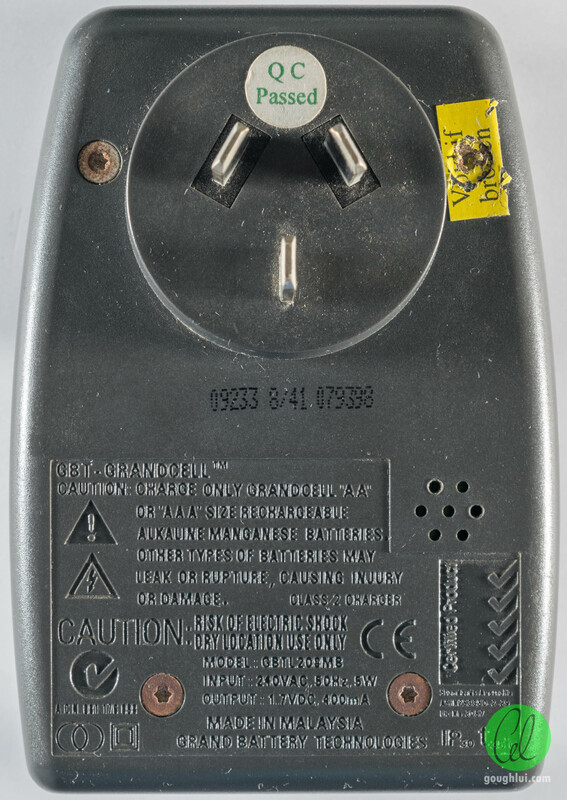 The GBTL208MB is a relatively early example, prior to the newer dual-standard capable chargers, only working with rechargeable alkaline manganese batteries. It claims to output 1.7V at 400mA, featuring two LEDs which indicate power (red) and fully charged (green). The battery compartment accommodates AA and AAA batteries by virtue of a spring-pivoted negative contact. For larger cell sizes, adapter sleeves were also sold. The unit is made in Malaysia, and claims to be a Certified Product. The unit was designed to plug into the wall, in the worst wall-warty way imaginable, occupying excess room to both sides of the plug. Even to this day, similar chargers are still purchased on the claims that this particular charger is good for recharging any alkaline cell. Apparently, some people believe that the charger is somehow especially effective at this due to its design. Removing the Torx screws allows us to get inside, where we find the charger itself to be a relatively unsophisticated linear-analog affair. The unit appears to be made by Teletron Industries of Malaysia, with a transformer based input that goes to a full-bridge rectifier made of discrete diodes. From there, an LM317 linear regulator is used as a linear regulator to drop excess voltage. Each of the channels is current-balanced with transistors – one per channel, with one or two zener diodes acting as voltage references. The PCB is a single layer paper type with solder resist. Traces are surprisingly square, with trace widths not being particularly equal. 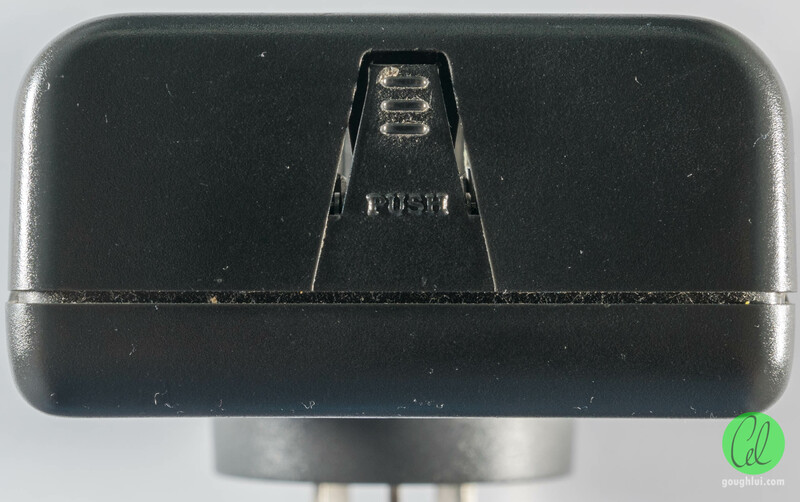 The rear plug is secured by a screw, which probably allows it to be more easily localised for different countries. At the time Grandcell rechargeable alkaline manganese were launched, rechargeable battery technology was still dominated by NiCads with a capacity of about 600mAh to 1000mAh at the most, which was about a third or a half of that of alkaline cells. Their promise was to provide alkaline-level performance with rechargeability, offering pre-charged batteries which were much cheaper than NiCad rechargeables and only (from memory) about twice as expensive as disposable alkaline cells. Considering the environmental benefits and claims of up to 25-cycles in magazine advertising (10-20 in their FAQ), it was an economically attractive proposition but one which fell short in practice. Even a year later, when the first commercially-available Ni-MH cells began to appear on store shelves in Australia, their capacity was 1200mAh and the price was still expensive. I would know, because I rushed to buy the green-and-gold coloured Energizer cells. Appropriate chargers were also expensive, but it seems that Grandcell saw the writing on the wall, later offering Ni-MH and RAM dual-standard chargers and Ni-MH cells under their own branding. Years later, Ni-MH technology advanced to the point where Sanyo’s Eneloop reduced self-discharge to the point it was feasible to sell pre-charged batteries. Cycle life improved as well and capacities of 2000mAh for such low-self-discharge (LSD) versions were feasible, with 2850mAh claimed for the highest capacity non-LSD versions. This rendered RAM technology rather irrelevant, along with the increased adoption of Li-ion based batteries. Even though RAM batteries are no longer available, such chargers are still used by some to recharge regular alkaline batteries. During the time Grandcell was around, I wondered what the difference between RAM and regular alkaline batteries were and whether this was a deliberate misinformation exercise to profiteer from selling regular alkaline cells at a higher price on the premise of limited rechargeability. While the charger doesn’t appear to be particularly smart, I wonder if it does anything particularly special to warrant keeping around. 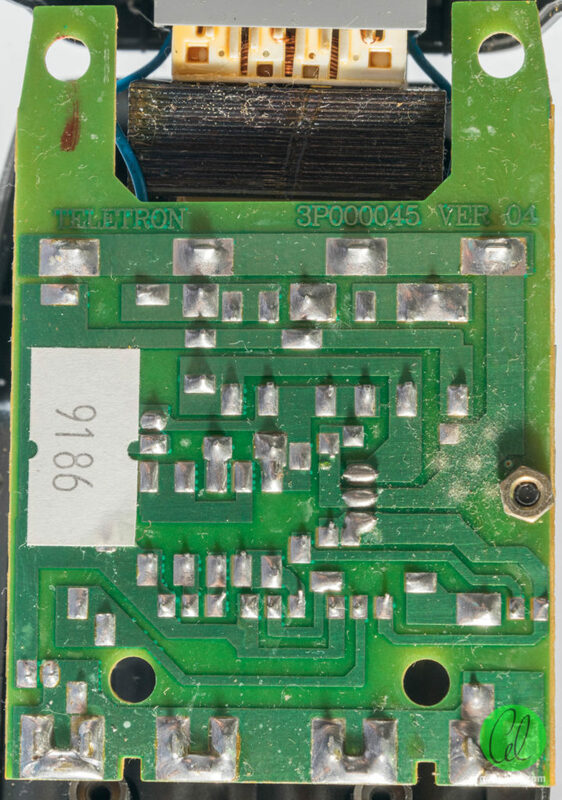 This entry was posted in Electronics and tagged battery, charger, teardown. Bookmark the permalink. There still appears to be some rechargeable (secondary) alkaline batteries on the market. I found some on Amazon. They are not as good as NiMH batteries but are useful for devices, which will not work with 1.2 V batteries. From what I have read recharging primary alkaline batteries is not a good idea they can release hydrogen and if charged for too long they get very hot and leak. I understand that Union Carbide made the first secondary alkaline batteries and they are different to primary alkaline batteries. 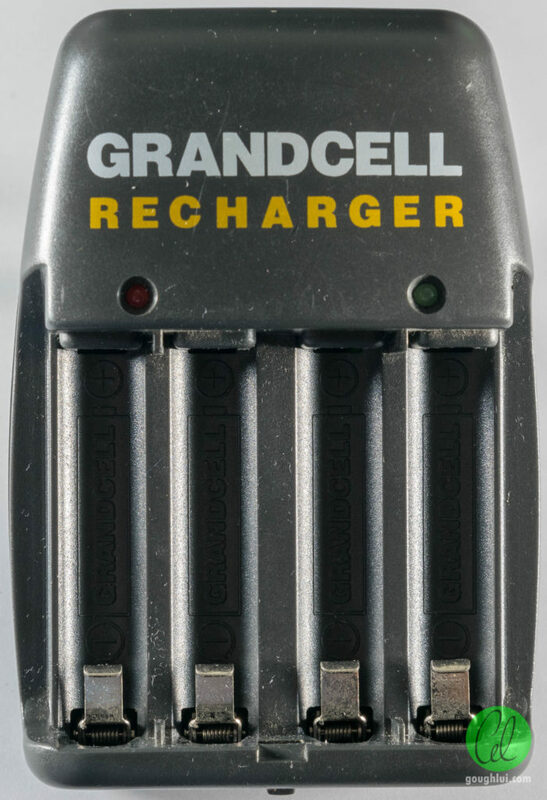 From the description of the Grandcell charger it sounds fairly basic and doesn’t seem to have any special features. For example: I have an Energiser NiMH charger, which charges batteries within 1 hour. This unit has temperature sensors (thermistors) to check the battery temperature and stops charging if the batteries get too hot. I no longer use it because the rapid charge reduces the life of the batteries.